Not to be confused with Critique. For other uses, see Critic (disambiguation). 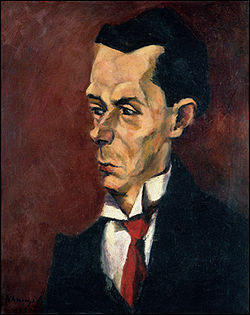 Critic by Lajos Tihanyi. Oil on canvas, c.1916. A critic is a professional who communicates an assessment and an opinion of various forms of creative works such as art, literature, music, cinema, theatre, fashion, architecture, and food. Critics may also take as their subject social or government policy. Critical judgments, whether derived from critical thinking or not, weigh up a range of factors, including an assessment of the extent to which the item under review achieves its purpose and its creator's intention and a knowledge of its context. They may also include a positive or negative personal response. Characteristics of a good critic are articulateness, preferably having the ability to use language with a high level of appeal and skill. Sympathy, sensitivity and insight are important too. Form, style and medium are all considered by the critic. In architecture and food criticism, the item's function, value and cost may be added components. Critics are publicly accepted and, to a significant degree, followed because of the quality of their assessments or their reputation. Influential critics of art, music, theatre and architecture often present their arguments in complete books. One very famous example is John Ruskin's Seven Lamps of Architecture and The Stones of Venice. Critics may base their assessment on a range of theoretical positions. For instance, they may take a Feminist or Freudian perspective. Unlike other individuals who may editorialize on subjects via websites or letters written to publications, professional critics are paid to produce their assessment and opinions for print, radio, magazine, television, or Internet companies. When their personal opinion outweighs considered judgment, people who give opinions, whether on current events, public affairs, sports, media or art are often referred to as "pundits" instead of critics. Critics are themselves subject to competing critics, since the final critical judgment always entails some subjectivity. An established critic can play a powerful role as a public arbiter of taste or opinion. Also, critics or a coordinated group of critics, may award symbols of recognition. The word "critic" comes from Greek, Modern κριτικός (kritikós), meaning 'able to discern', which is a Greek derivation of the word κριτής (krités), meaning a person who offers reasoned judgment or analysis, value judgment, interpretation or observation. Early English meaning of criticism was based mainly on the criticism of literature and it was in the 17th century that more general forms of criticism began. Cultural critic Clement Greenberg wrote that a good critic excels through "insights into the evidence … and by … loyalty to the relevant"; poet and critic T.S. Eliot wrote "a critic must have a very highly developed sense of fact". In 1971, Harold C. Schonberg, chief music critic of The New York Times from 1960 to 1980, said that he wrote for himself, ''not necessarily for readers, not for musicians. ...It's not a critic's job to be right or wrong; it's his job to express an opinion in readable English.'' Schonberg was the first music critic to receive the Pulitzer Prize for criticism. Daniel Mendelsohn described the equation of criticism for critics as knowledge + taste = meaningful judgement. Restaurant critic Terry Durack explained that from a critic "you hope for a thorough, objective and legitimate discussion" that puts "opera, art or book into context, so that it adds to your own body of knowledge"; in the context of a restaurant criticism, this means it is "not about me liking it or not; it's about me helping you decide whether you are going to like it or not." Social and political critics have used various forms of art to express their criticism, including literature and music. Pierre Beaumarchais, for example, prior to the French Revolution, used his play The Marriage of Figaro to denounce aristocratic privilege. A critic's influence is enhanced by subsequent reworkings such as the operatic versions of Beaumarchais's play (The Barber of Seville) by Rossini and (The Marriage of Figaro) by Mozart. Among the most famous social/political criticism in literary form are Jonathan Swift's satire Gulliver's Travels and George Orwell's satire Animal Farm. Some political critics, such as Ai Weiwei use visual art as their medium. Throughout history, political critics have faced higher risks, including the risk of imprisonment or death. Several websites have developed for the purpose of compiling or publishing original critical reviews. Examples include BlogCritics Magazine, Rotten Tomatoes, and Yelp. According to A. O. Scott, chief film critic for The New York Times, everyone on the Internet is a critic. Some critics like Roger Ebert achieve iconic status in pop culture and become well regarded. The American film critics Roger Ebert and Gene Siskel collaborated and appeared on television sometimes agreeing on their review of cinematographic works; sometimes they would differ. Film critics may use star classification to qualify the reviewed works. Characters depicting critics have been part of some movies, and have been represented in comedies, such as a food critic in the animated fantasy-comedy Ratatouille, and as an art critic in one of the initial parts of the anthology comedy film The History of the World Part I. People whose work is the subject of criticism have a full range of responses to it. For example, they may be appreciative, offended, distressed, encouraged, amused or nonplussed. We do not object to criticism; and we do not expect that the critic will read the book before writing a notice of it. We do not even expect the reviewer of the book will say that he has not read it. No we have no anticipations of anything unusual in this age of criticism. Satirical comment about potential criticism by Mark Twain and Charles Dudley Warner in their Preface to the American Edition of their co-authored novel The Gilded Age: A Tale of Today. ^ Dolan, Jill (October 24, 2012). The Feminist Spectator as Critic. University of Michigan Press. ISBN 0472035193. ^ Greenberg, Clement (1961). "T.S. Eliot: A Book Review". Art and Culture – Critical Essays. Boston: Beacon Press. p. 239. ^ Kozinn, Allan (July 27, 2003). "Harold C. Schonberg, 87, Dies; Won Pulitzer Prize as Music Critic for The Times". The New York Times. ISSN 0362-4331. Retrieved March 28, 2016. ^ Mendelsohn, Daniel (August 28, 2012). "A Critic's Manifesto". The New Yorker. ISSN 0028-792X. Retrieved March 27, 2016. ^ Spiegelman, Willard. "Everyone's a Critic". Wall Street Journal. ISSN 0099-9660. Retrieved March 27, 2016. ^ Durack, Terry (December 3, 2016). "The role of a restaurant critic in the digital age". The Sydney Morning Herald. Retrieved December 5, 2016. ^ Craven, Peter (December 16, 2015). "The Spectacle of Skill review: The genius of Robert Hughes as critic and writer". The Sydney Morning Herald. Retrieved March 29, 2016. ^ "HRW Calls for Release of Thai Government Critic". VOA. Retrieved March 27, 2016. ^ "Zambian opposition leader arrested for 'defaming' President Lungu". africanews.channel. Retrieved March 27, 2016. ^ Shah, Saeed; Nauman, Qasim. "Pakistanis Throng Funeral of Man Hanged for Killing Critic of Blasphemy Laws". Wall Street Journal. ISSN 0099-9660. Retrieved March 27, 2016. ^ "Thousands march in Moscow to honor slain Kremlin critic Nemtsov". Reuters. February 28, 2016. Retrieved March 27, 2016. ^ "Beijing Critic Says Family Detained in China in Internet Crackdown". VOA. Retrieved March 27, 2016. ^ Scott, A. O. (January 30, 2016). "Everybody's a Critic. And That's How It Should Be". The New York Times. ISSN 0362-4331. Retrieved March 27, 2016. ^ Rothman, Lily. "Roger Ebert Statue Unveiled Outside Illinois Theater". TIME.com. Retrieved March 27, 2016. ^ "Man Arrested for Overdue Tom Green Rental From 2002". NBC News. Retrieved March 27, 2016. ^ Child, Ben (April 25, 2014). "Statue commemorating thumbs-up film critic Roger Ebert unveiled". The Guardian. ISSN 0261-3077. Retrieved March 27, 2016. ^ Mark Twain and Charles Dudley Warner (1903). "Preface to the American edition". The Gilded Age: A Tale of Today. Chatto & Windus. p. ix.